Costume Designer Dan Lawson explains how he styled the cast for the season finale episode, "Chaos." 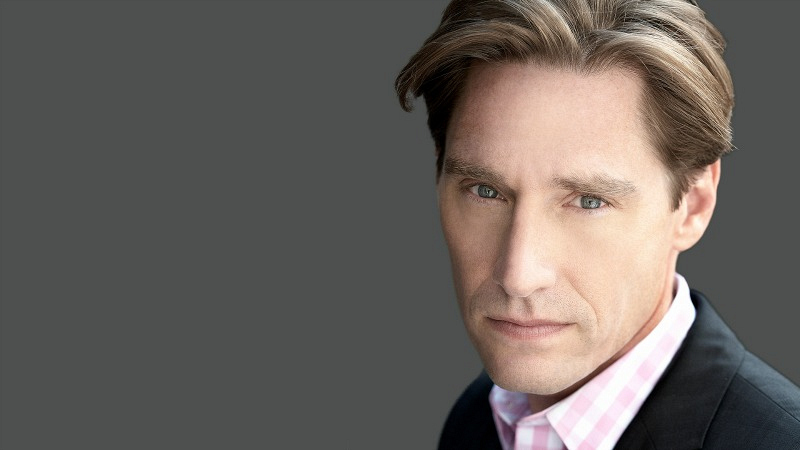 Costume designer Dan Lawson, the man behind your favorite characters' styles since the series premiere of The Good Wife, continues to dress the cast of The Good Fight in both timeless silhouettes and trendsetting ensembles. We caught up with the fashion guru to learn about his inspiration and style choices, and get insider fashion tips from the latest episode of The Good Fight, "Chaos." Name an adjective to describe each woman's style in this episode. For Diane Lockhart, played by Christine Baranski, "Parisian." For Lucca Quinn, played by Cush Jumbo, "Strong." For Maia Rindell, played by Rose Leslie, "Confident." What was your favorite piece from this episode? From this episode, my favorite piece was the spectacular floral and black color block Lanvin blouse that Barbara wore. I loved the play of floral pattern and black color block. 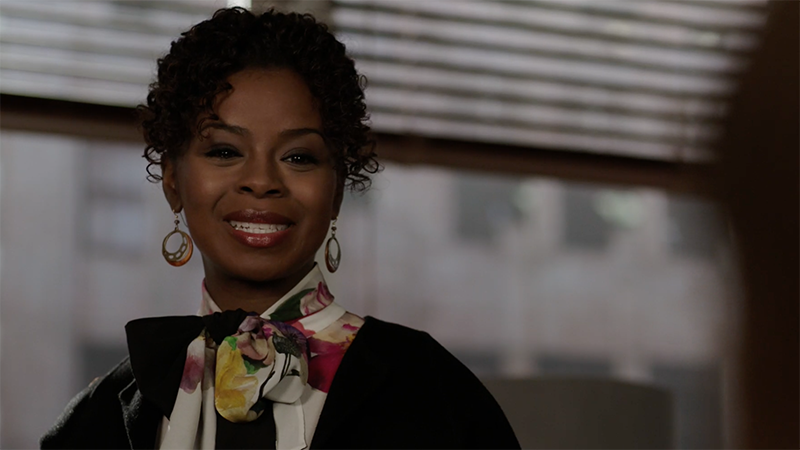 I thought it was so Parisian feeling and very, very elegant on Erica [Tazel]. Breakdown this look: Is there a specific way that you contrast Diane's fashion with Kurt's? Diane is completely Madison Avenue meets Park Avenue and Kurt is down on the farm. They are very much opposites in their individual styles. In this scene, Diane is wearing a magnificent deep red La Petite Robe Di Chiara Boni dress with a wonderful flourish in the skirt created by a self ruffle. Her coat is a black and white Lanvin trench coat. The two pieces played off each other very well. Kurt is wearing a wine, tan, navy, and green plaid Brooks Brothers shirt with a brown suede Brooks Brothers jacket and a pair of dark blue Paige jeans. He wears a pair of cowboy boots and my favorite accessory—my own personal belt buckle that was given to me as a gift when I was in junior high school. It's a Mexican silver Southwestern styled eagle that is embellished with turquoise, mother of pearl, and ebony. I absolutely love it and I get such a kick out of seeing Kurt wear it! Ah! 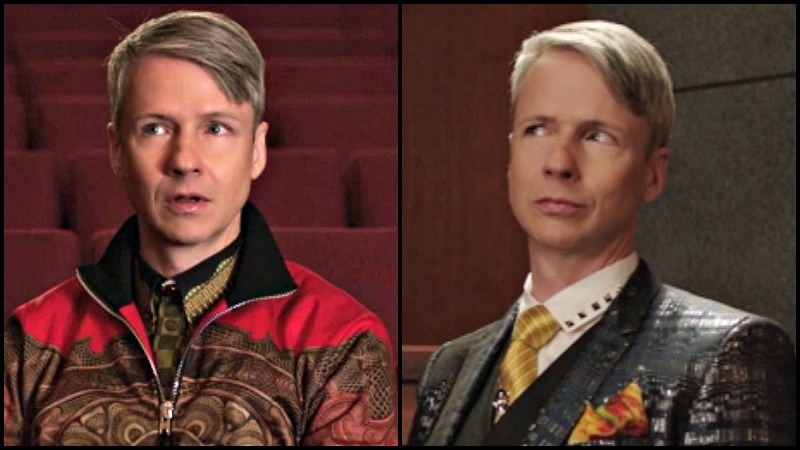 The return of John Cameron Mitchell! How lucky are we?! You know, he and I were both at Northwestern University at the same time. He was a few years ahead of me and certainly the star of the school! It was fun to get to see him and work together. Keeping the outrageousness of Felix's look while maintaining a certain elegance was the key to designing Felix's costumes. His first look was a gold and red Givenchy dress shirt and jacket. We wanted the costume to look like Felix was dressing to appear before a college audience. We didn't want him in a suit, but something that looked like he was trying to be "one of the kids"—albeit way over the top. For his second look, he had a costume change for court. We loved the idea that he put on a suit to appear in court—a costume for a performance, so to speak. That fabulous suit he wore was a blue and metallic silver Dolce and Gabbana. He wore a leather The Kooples vest with silver skull buttons. His shirt was a Valentino white dress shirt with silver studs on the collar. His tie was a yellow striped Brioni. We got a skull button from M&J Trim in New York to use as a tie tack. This was really fun because John wears clothing so well and he was really into wearing these over the top costumes. Is there symbolism behind having Maia wearing a gray coat in both the premiere and finale episode when her father is arrested/skips out? I like when characters reuse pieces that real people would reuse—coats, shoes, skirts, pants, jewelry, etc. 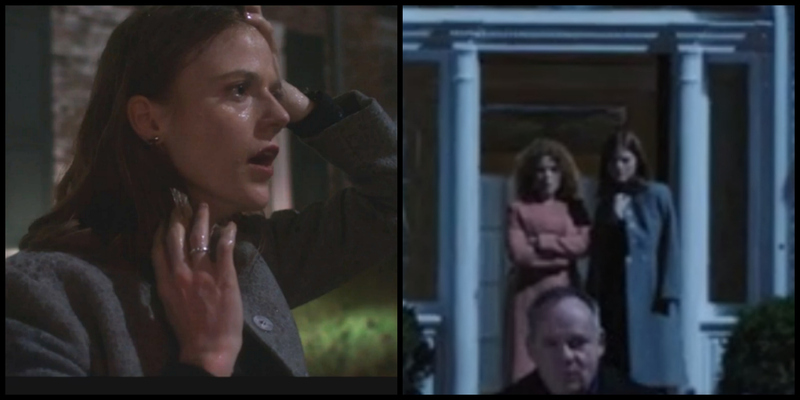 I thought this gray coat from Rebecca Taylor worked really well at the end of this episode because Lenore was in a blush pink coat and Henry was in a navy coat. So I wanted Maia to be in a midtone neutral coat. So I used the same coat she had worn in the first episode, which I thought was extra meaningful since her dad is leaving just as he was in the first episode. See all of Dan Lawson's creative fashion curations from The Good Fight's latest episode, "Chaos," available exclusively through CBS All Access. Stream all episodes of The Good Fight now on CBS All Access.